Here I will post things I find inspiring outside and perhaps not directly correlated with my own work, whether it be other Etsy sellers, photos, fashion, prints, nature, etc. I think that you will dig this for 3 reasons: 1.) Who wants to hear about just me all the time... I mean, really? 2.) This will be a great way for me to formally define what inspires me in hopes of starting conversations and sharing inspirations with each other. I also think that 3.) this will be a good networking tool, as I am always on the look out for blog lovin' and spreading the word about other great Etsy sellers. So, with no further adu, let the lovin' commence! I LOVE BIG, BOLD PRINTS. Love 'em love 'em love 'em. If you were to look around my house you will find big, bold reds, pinks, blacks, and limes surrounded with splashes of prints. Most of the stuff I buy is either at IKEA or stuff I find along the way (CB2 is one of my favorites. Here is a picture of the edge of my living room leading into my kitchen - we painted the main living room wall red; b/w striped rug is from IKEA's as-is section and the Chinese chopstick plates are from Crate and Barrel - I am proud that I bought them LONG BEFORE either Chinese or lime were "in"). One day, while watching Project Runway (RIP until August, dear friend) I noticed a SUPER SWEET wall canvas on the contestants' apartment wall, I saved the DVR of it for months in hopes that I could one day find the print somewhere and make an acrylic version of it myself. I even bought the colors and the canvas, took a picture of the paused TV screen and was ready to go, but when I moved to LA I thus lost the recording and my inspirational piece. And when my camera pooped out on me, well, let's just say I was more upset about losing the pic of the print than I was of my pictures of family and friends. Yes. 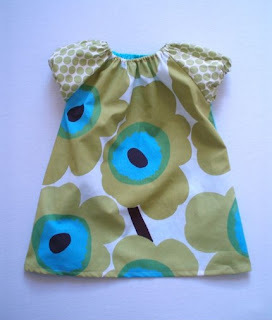 Today on Etsy I happened to stumble upon a product that used the same long-lost material I have gone ga-ga over (visit Kid A Collective to see the rest of her super-cute-kid-clothes Etsy shop!). Thankfully, Maria's shop listed the designer and label of the dress' print: Pieni Unikko. Upon further research (Wiki counts as research, right? ), I found out that the print is from the Finish line of textile called Marimekko, and was started by a Finish gal named Maija Isola in the 40's! It has recently found itself in the spotlight again, and people all over the place are ripping the print off, including car makers (too much for me) and this Charles David shoe (ugh). Now that I know the name, I have discovered that the label, Marimekko, is everywhere. H&M did a line of Marimekko clothes last Spring (and, to my surprise, I recognized the black and white dress on the left -- it's in my closet! Turns out I have been an official Marimekko fan all along!). Apparently Dolce and Gabbana did a knock-off line a few years ago that doesn't really do the pattern justice, in my opinion, and of course is totally overpriced. I would rather make it myself with IKEA fabric (to read all about it, click here). Either way, I am out to find all the Marimekko I can get (thankfully they have a branch store here in LA!). These pattern make me feel alive and inspire me to surround myself with bold color and bright, lively flowers! So, what inspires you today? hey, so glad you have discovered marimekko! as a finnish girl myself, i am so proud when i see finnish design making its way into people's homes and hearts! We LOVE Marimekko; so glad you do, too, and that you were kind enough to feature our chair! There is a Marimekko store here in Cambridge, and it's our favorite place to run errands. Since you also love IKEA, you will be excited to learn (like we were!) 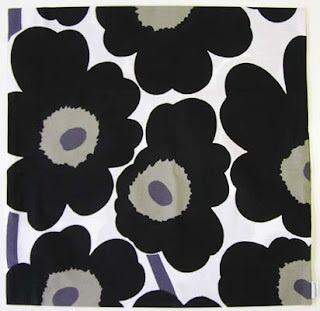 that Bemz (http://www.bemz.com/) and Marimekko have teamed up to offer slipcovers in a range of their fabrics. We're gonna save up our pennies to get a new cover for our couch. 1. Top Chef, Master Chef Edition started last night- with 24 world renowned chefs competing to win (prize money going towards a charity of their choosing). So you might be into that for Wednesday night TV. 2. Love the Marimekko prints. I was just browsing the prints at Ikea, as we might take a trip there this weekend. I want to do some bold curtains in our guest room, craft/music room, and reading rooms. Plus, if there's something I love, but think is too much for a curtain, I'm hoping to make a wall hanging as a focal piece for the guest room. I used to have Marimeko sheets as a kid. Love the bold prints! Love this idea for Wednesdays. You're gonna make my Wednesday (or Thursday as it happens to be) much, MUCH brigheter! I used to have Merimeko sheets when I was a kid. Love the bold prints! You're going to make my Wednesdays (or Thursdays, as the case is today) really brighten up!